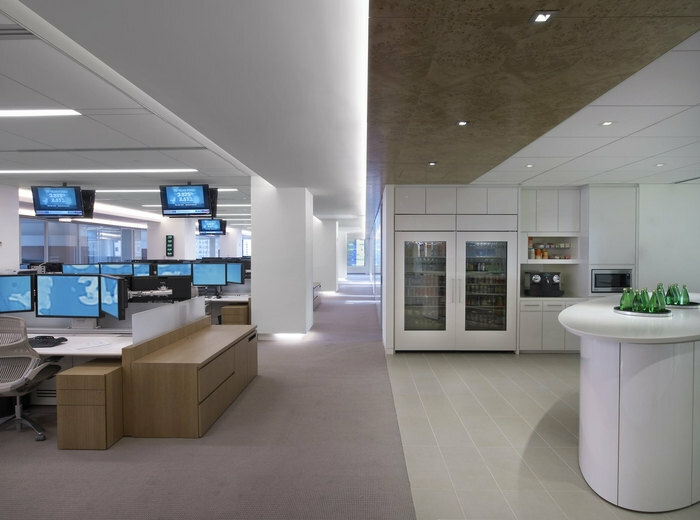 Frank & Marcotullio Design Associates have designed the new offices of an asset management company located in midtown Manhattan, New York. This asset management company was looking to expand their headquarters to accommodate their fast growing company. The selected location is a spacious 100,000 square foot space on four floors overlooking Central Park in Midtown Manhattan. The site was chosen for its panoramic views and flexibility for design. The design provides an efficient workflow that is open and interactive with low workstations and high ceilings. Daylighting filters light throughout internal areas and allows exterior views for all. The trading room features custom trading desks with an open lounge area. An Italian fabricated metal and glass wall system designed with opaque and transluscent bands adds distinctness to the office fronts and provides a combination of acoustic privacy and visual openness. A state-of-the-art conference center was designed with sophisticated AV technology for teleconference, video, and smart board presentations. The monochromatic beige palette is juxtaposed with unique woods, textured fabric panels, custom rugs, and over-scaled artwork. The two-story open stairwell beyond reception is detailed with Italian stone and lacquered panels. The use of white back-painted glass accents at the furniture and architecture in addition to a backlit onyx wall supporting the executive stairwell enhance this elegant, distinctive investment firm.